As much as we make every effort to bring you the best experience possible in buying your cheese on line, nothing is ever going to compare with actually entering into one of our cheese shops. If, rather than selecting and ordering our products on line, you would prefer to experience the delights of seeing (and smelling) the huge range of our artisan cheeses, then why not visit us. You will have heard of many of our cheeses, but there may be several which are new to you. Come in and let our knowledgeable staff tell you about them. You can taste the cheeses and if one is not quite to your liking, we can recommend something that may be more to your taste. And, of course, there is an array of crunchy crackers, salted oaty biscuits, giant jars of possibly the best Piccalilli and chutneys as well as our extensive range of cheese accessories - everything you could possibly want to store, display, cut and serve your cheese. If you would like to place your order on the web site but prefer not to pay for the delivery then try our FREE Order Online and pick up in store service. Simply order on line one day and collect your purchases the next day from your chosen shop. 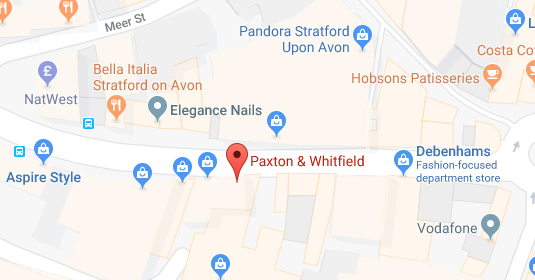 This service is available at all four Paxton & Whitfield shops in Jermyn Street, London SW1; Cale Street, London SW3; Stratford upon Avon and Bath. 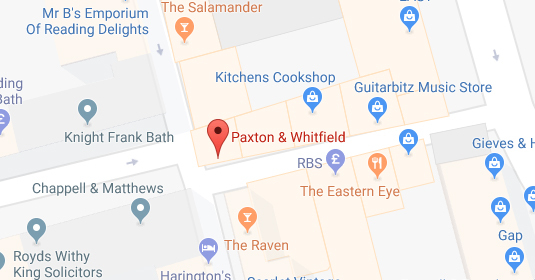 With its iconic black and gold frontage and enticing, gourmet window, the Paxton & Whitfield store in Jermyn Street is the oldest and best recognised of our branches. It satisfies the cheese demands of retail and wholesale customers alike with exceptional expertise, customer service and of course, a plethora of the highest quality cheeses, matured on site in the underground cheese cellars. There is a small event space where we can host parties, tutored tastings or cheese and wine matching challenges. 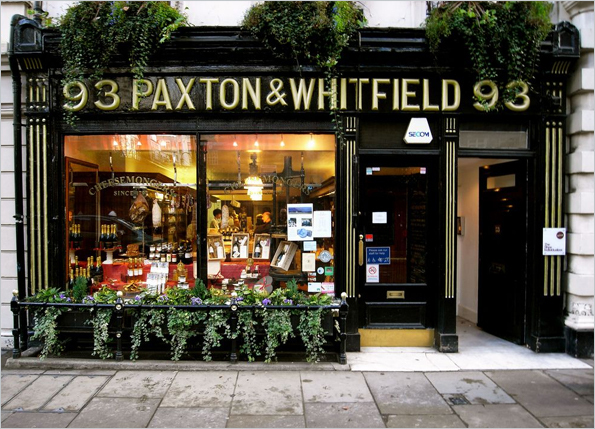 Paxton & Whitfield, Jermyn Street supplies the restaurant trade in London and the Home Counties. 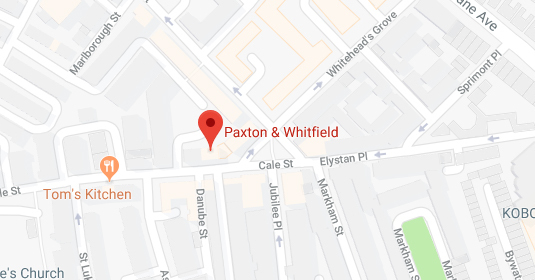 Paxton & Whitfield's newest shop can be found in the heart of beautiful Chelsea Green. Chelsea Green is a well-known local neighbourhood food area with a fishmonger, butcher, green grocer and wine merchant, the perfect place to buy quality fresh food. Here food lovers can treat themselves to a wide range of delicious artisan cheeses from Britain and the Continent, mouth-watering fine foods, exclusive cheese accessories and gorgeous hampers. The Cale Street shop is also available for hire for private events for up to 6 people. We can host tutored tastings or cheese and wine matching challenges. Perfect for occasions or entertaining clients. 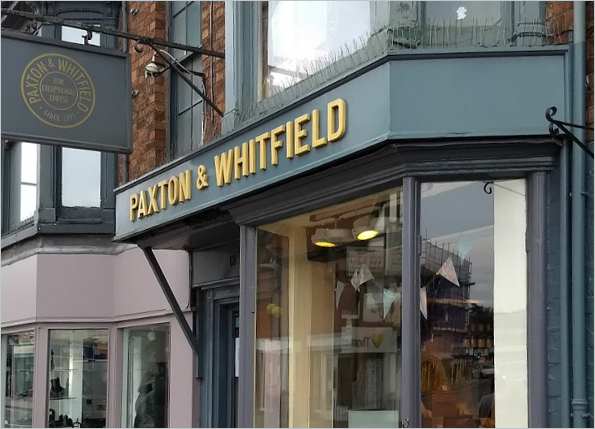 The ultimate experience for cheese lovers, Paxton & Whitfield in Stratford upon Avon is an Aladdin's Cave of the finest cheeses and other fine food, with a particular emphasis on delicious products sourced locally from the Cotswold and West Midlands region. The shop has low ceilings and beams and houses not only an array of excellent produce, but a professional and passionate team of knowledgeable staff to help advise on the best choices to meet your requirements - be they ideas for a snack, cheese board or eye catching cheese wedding cake. 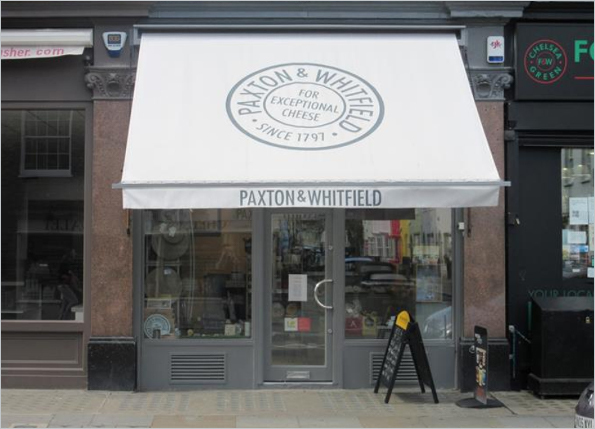 Paxton & Whitfield, Stratford supplies the restaurant trade in Wales, the Midlands, Northern England and Scotland. A light, bright shop with a stunning window and views towards Queen Square, this shop is undoubtedly one of the experiences that should be incorporated into any trip to this World Heritage City. 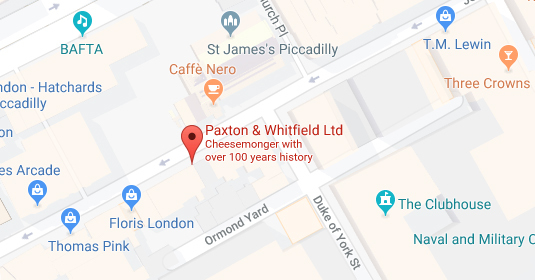 Situated in one of the charming buildings of the city centre, what the shop lacks in floor space it makes up for in abundant cheese and a wealth of knowledge and enthusiasm from the team. A real jewel of a shop that leads its customers in their quest for the ideal cheese with humour and passion and a good deal of tasting. 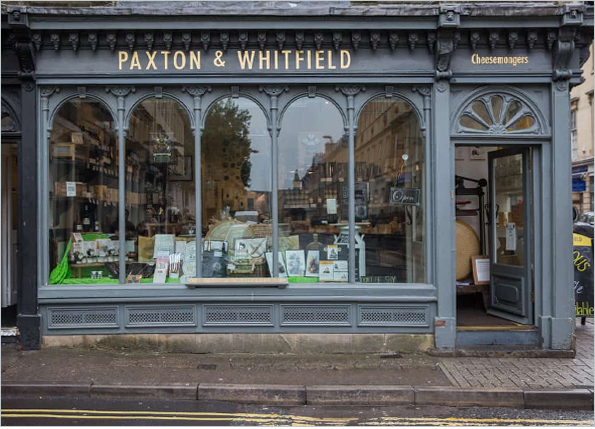 Paxton & Whitfield, Bath supplies the restaurant trade in the South East and South West of England. 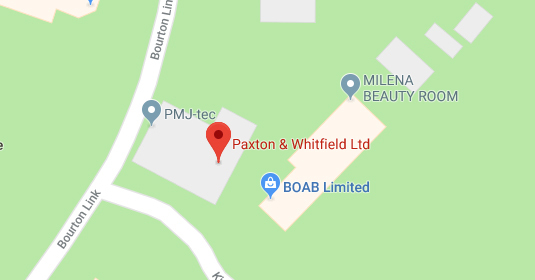 Our warehouse is centrally situated in Bourton on the Water in the Cotswolds. With its built-in maturing rooms this is the perfect place for us to fulfil our Wholesale and Web/Mail Order business. Most of our Head Office activities are also carried out from here. 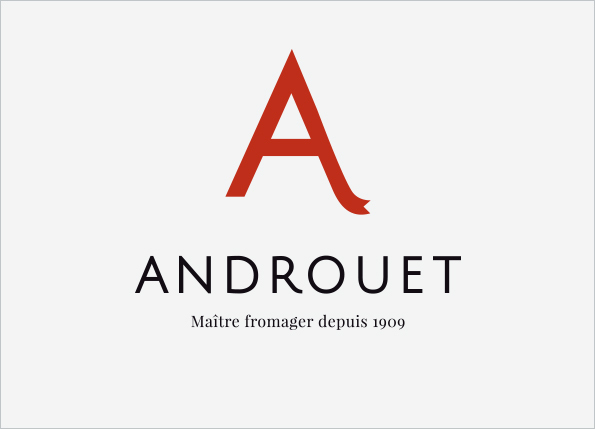 In 2009 we joined forces with Parisian based Fromagerie Androuet to create an exciting new fine cheese partnership. 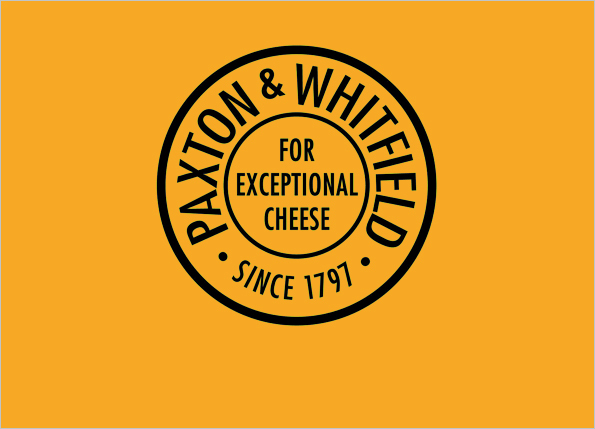 This venture sees British cheeses from Paxton & Whitfield being sold in Androuet's six shops in Paris and Paxton & Whitfield stocking French cheeses selected in partnership with Androuet in its UK stores and online.